Any type of needle, syringe, or medical object that has a sharp point or edge is something that needs to be disposed of properly. Also known as Sharps, there’s dozens of businesses, medical providers and individuals that use items that require proper Sharps Disposal. Medical Waste Pros has experts in your area that can help you with proper sharps disposal. We’ll connect you with a medical waste disposal professional that can provide pickup or mail-back containers to ensure your medical waste is disposed of safely and securely. Protect your sanitation workers from exposure to potentially hazardous materials by hiring a local medical waste disposal professional. What is ‘Sharps’ and Sharps Disposal? Sharps are generally defined as any Item that can prick or penetrate the skin or can puncture waste bags and cardboard boxes that could potentially spread infectious agents- specifically Hepatitis B (HBV), Hepatitis C (HCV), and Human Immunodeficiency Virus (HIV). When you dispose of Sharps, there are specific requirements on the state and federal level for handling and packaging by OSHA and the Department of Transportation. One used, any of the Sharps listed above should be placed in a Sharps disposal container. These containers are leak-proof and made of a puncture-resistant plastic and puncture-resistant lid that can be handled without concern or risk of exposure. Be sure to never place any loose Sharps in any trashcan or recycling bin- and never flush Sharps down the toilet. If you do, you’re putting janitors, housekeepers, children, and other sanitation workers in harm’s way. Even if it’s just for your pet, the guidelines are the same- be sure to use the same Sharps guidelines to safeguard anyone that could be exposed to Sharps waste. 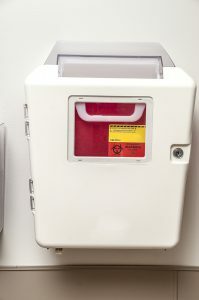 Medical Waste Pros will connect you with a safe, reliable local Sharps disposal provider. They can recommend the best disposal system for your needs, from a mailback system to regularly scheduled pickups. What you need really depends on how much and how often you need medical and hazardous waste disposal. To get started, fill out the form to the right, or give us a call at (888) 755-6370. Within minutes, we’ll get you free, no obligation quotes within minutes!